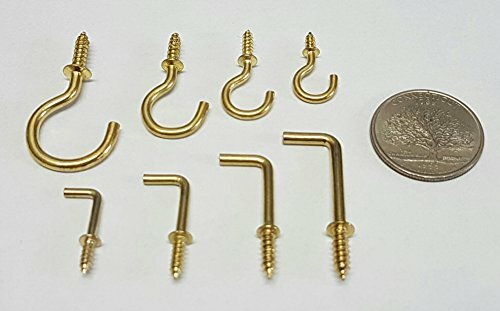 Cup Hook Assortment Kit, for Cups, Ceiling, Mobiles, Wind Chimes, Lanterns and More, Cup Hook 3/8" - 6/8", Square Hooks 1/2" - 1", (90 Pieces). Product prices and availability are accurate as of 2019-04-17 23:24:02 UTC and are subject to change. Any price and availability information displayed on http://www.amazon.com/ at the time of purchase will apply to the purchase of this product. Ceiling and cup hook Assortment Kit: High Value assortment a variety of 8 different parts to suit your needs, 90 pieces in total, Brass finish, Easy to install, pre-drilling is not required, but it is recommended for best results. Indoor use: Hang coffee mugs under cabinets, keys near your door, brooms, mops, and dustpans in your pantry. Organize your jewelry, or for purses and belts in your closet. Outdoor use: Sleek enough to use indoors but durable enough for the outdoors. Hang wind chimes, lanterns, bird feeders, patio lights. 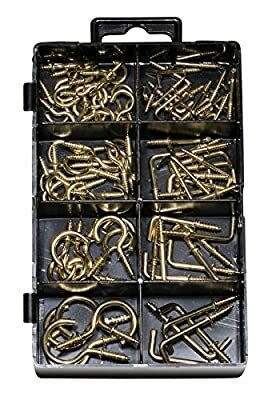 Great kit for the home, office, workplace, Comes in a handy Plastic organizer case for easy storage Small kit, fits neatly in kitchen and office drawers, Hardware and Craft Cabinet. High value assortment a variety of 8 different parts to suit your needs, 90 pieces in total, great kit for the home, office, workplace. Indoor use: hang coffee mugs under cabinets, keys near your door, organize your jewelry, or for purses and belts in your closet. Outdoor use: sleek enough to use indoors but durable enough for the outdoors, hang wind chimes, lanterns, bird feeders, patio lights. Brass finish, easy to install, pre-drilling is not required, but it is recommended for best results, (see product description for detailed sizes). Comes in a handy plastic organizer case for easy storage small kit, fits neatly in kitchen and office drawers, hardware and craft cabinet.